When our first baby was only three days old, she choked while lying down and couldn’t breathe for a few seconds. It was probably only about ten seconds or so, but to my brand new parent, sleep-deprived mind, it seemed like much longer. Luckily, I was awake and checked on her before anything tragic happened, but it set the tone for the first few months of parenthood, and every night, my husband and I took turns staying awake while she slept so we could be sure nothing happened to her. In case you’re wondering, that is not a sustainable way to live, but it took a long time to shake off the anxiety from that one scary moment. What I wish we’d had then (and what we will definitely be getting for our next baby) is a wearable baby monitor to track our baby’s breathing so we didn’t have to. Wearable baby monitors come in several types, including socks, one-piece bodysuits, and detachable clips or snaps. Each of the monitors on this list is a little different, but all of them track a baby’s breathing, giving new parents a chance to catch up on a little sleep. The Owlet baby monitor is a single sock that uses pulse oximetry to monitor your baby’s heart rate and oxygen levels. Pulse oximetry is used by doctors and hospitals (usually as a clip placed on your finger for a few moments) to measure blood flow. It works by shining a small light through the skin and estimating oxygen levels based on how much light is transmitted back to the sensor. The Owlet sensor sends that information to a nearby base station via low-energy Bluetooth (which emits less radiation than a cell phone), and the base station then communicates with your smartphone over Wi-Fi. If your baby’s heart rate rises above or dips below the preset range, or if oxygen levels drop below a preset threshold, both the base station and your phone will sound an alarm. The base station is meant to the be the primary alert system with the smartphone as a secondary convenient alarm. You also get alerts if you move your baby out of range of the base station or if the baby is moving too much for the Owlet to get a good reading. You can adjust the alert preferences in the app, though the preset alarm ranges are not adjustable. The app is very straightforward and user friendly; the main drawback here is that the Android app is still in beta testing, though the iOS app is updated and functional. The price is higher than some other wearable monitors, but the Owlet performs very well according to user reviews, and because you get three sock sizes with your initial purchase, you won’t need to buy extras. The sock is washable and generally fits babies up to 18 months old, so it can be used for longer than some of the other products on our list. Plus, with the base station as an alert system, the Owlet is perfect for parents who don’t want to rely on their phones (or don’t have smartphones) to monitor their babies. This wearable baby monitor comes in the form of a machine-washable bodysuit with two breathing sensors and a turtle-shaped movement sensor that snaps into the bodysuit. With these pieces in place, you receive information on your phone about your baby’s breathing, skin temperature, body position, and sleep activity in real time all night long. The Mimo uses low-power Bluetooth to transmit information to the base station, which also charges the movement sensor. The base station then sends the data to your phone via Wi-Fi. As an added bonus, the base station captures sounds so you can tune in to use it as an audio monitor as well. If the monitor needs to alert you, you’ll receive a push notification on your phone, as well as an audible alarm if the Mimo detects irregular breathing. One of the Mimo’s greatest advantages is its compatibility with the Nest Smart Learning Thermostat and Nest Cam. You can use the app to tap into the Nest Cam and check on your baby, view screenshots of your baby, and adjust the room’s temperature if you notice your baby is too hot or cold. The biggest drawback to the Mimo is that you’ll need to buy bigger sizes as your baby grows, which you don’t have to do for any other product on our list. Your original Mimo purchase comes with three bodysuits of the same size, but you’ll likely need more than that if you use the Mimo every night, making the overall cost much higher than for the other products on our list. The other problem is that, as with any wireless monitor, the strength of your Wi-Fi signal will make a huge difference in the Mimo’s performance. Overall, parents are pleased with this product and specifically praised the app (available for both iOS and Android) for its user-friendliness. This monitor gives you more information about your baby than other monitors on our list, plus it has some smart home options that you won’t find elsewhere, making it our top choice for parents who want to know everything they can about their sleeping baby. The MonBaby Smart Breathing Monitor is a button that snaps onto any article of clothing over a baby’s chest. Once the monitor is in position, your phone receives real-time updates and alerts for your baby’s breathing (no detected breathing movements for 15 seconds will trigger the alarm) and position (either back or stomach). You’ll also be alerted if it detects a fall or large movements, if the battery is running low, or if the phone loses connection with the MonBaby. The MonBaby uses low-energy Bluetooth to communicate with your phone, so the range is about 40 feet, depending on the construction of your home. The MonBaby uses a coin-cell battery, which is an advantage because it does not need to be recharged every day, but also a disadvantage because the battery will last only about four weeks of nightly use before needing to be replaced. User reviews are mixed, with the top complaints being the short battery life and the limited Bluetooth range with frequent disconnections. However, parents recommend the device based on how easy it is to set up and move to a new outfit (versus having to change your baby’s bodysuit completely) and the ability to adjust all of the alerts within the app. The MonBaby is a great low-stress option for parents who want something simple to monitor baby’s breathing at night that can be used and reused with every child, making it an overall less expensive option than many of the others. The Snuza Hero SE is a movement monitor that attaches to the top of a baby’s diaper with the tip of the device resting on the baby’s abdomen. 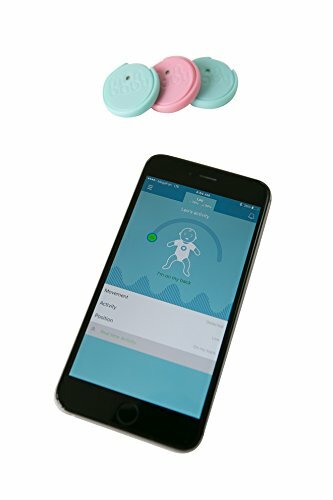 The Snuza tracks abdominal breathing movements; if no movement is detected for 15 seconds, the monitor will vibrate gently to rouse the baby. If the monitor still does not detect movement after five more seconds, an alarm will sound from the device. The Snuza is battery-powered, so there are no wires or cords to deal with, and it does not connect to your phone, so there are no radio frequency signals of any kind to worry about. However, that does mean you need to be in hearing range of the device to be alerted to a problem instead of getting a notification on your phone. The largest drawback to the Snuza is that it must maintain contact with the baby’s abdomen or you will get a false alarm. Any movement beyond breathing will make it inaccurate, so it cannot be used in the car, and you may get a lot of false alarms if you have a baby who likes to roll over or move frequently during sleep. In fact, some users simply stopped trying to use it once their babies became more mobile. Many parents have noted that the Snuza simply doesn’t work well for small babies. However, the vast majority of user reviews are positive and mention the reliability of the device and simply caution new users to expect several false alarms while learning how to clip on the Snuza just right. It’s also praised for its compatibility with any outfit. The Snuza Hero is a great option for parents who are willing to go through some trial and error to get a reliable breathing monitor for their baby that they can use for each child they have. The companies behind each of these products are very clear that the devices are not medical devices, nor do they reduce the risk of SIDS, but they are meant to give parents some relief and an additional way to monitor their babies. Additionally, they are meant for use with healthy babies whose heart rates and oxygen levels fall within normal ranges. Please note that using a wearable baby monitor is not a substitute for checking on your baby in person or employing the recommended practices for keeping your baby safe during sleep. While the evidence that links exposure to radio-frequency (RF) energy to negative health side effects is inconclusive, some experts warn that exposing newborns to these frequencies (through Bluetooth or Wi-Fi signals) can be harmful. We haven’t found any evidence that wearable baby monitors will have a lasting ill effect, and all of the wireless products on our list use low-energy Bluetooth, which emits less radiation than a cell phone. However, if you are concerned, take another look at the Snuza Hero SE, which is the only device on our list that doesn’t use Bluetooth or Wi-Fi. What will your baby wear? A bodysuit monitor gives you more information about your baby, but you’ll probably need to purchase additional bodysuits, and the cost goes up quickly. A clip-on monitor is easy to move from outfit to outfit and can be used for babies of any size, but they are limited primarily to motion detection, which can easily be inaccurate. A sock monitor is easy to reuse and doesn’t require you to purchase additional socks, plus the oximetry technology is reliable; however, too much motion will (again) give you inaccurate monitoring. None of these products is perfect, but the bottom line is that each one gives you, as a parent, another tool to help you care for your baby. A wearable baby monitor that can track your baby’s breathing and movement can provide you with the reassurance you need to relax at night, knowing that your baby is safe and sleeping soundly.